Stating that uplifting the weakest sections of the society indicates development of all, Arunachal Pradesh Governor, Dr B D Mishra said the poorest of the poor must benefit from the development schemes. 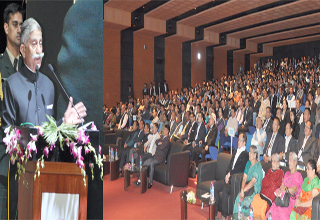 The Governor said this during the inaugural session of the two-day conclave, titled ‘Dream Change: Reshaping the Development Discourse of Arunachal Pradesh’ which got under way in the Plenary Hall of the State Legislative Assembly here on Friday. The Governor urged the participants in the conclave to explore means and ways for the inclusive growth in the state, ‘wherein the welfare challenges to the last man at the last rung of the society is addressed’. He urged them to focus on the 11 amenities – food, clothing, shelter, road, electricity, water supply, education, security, healthcare, justice, and employment – which, he said, should reach the people. Mishra reminded the participants that they must ensure that taxpayers’ money is utilized for development purposes with well-defined beneficial objectives. “There must be transparency, accountability and review and audit of fund utilization. Project implementation must have continuity and be done in safe and secure social environment,” he said. Chief Minister Pema Khandu in his address emphasized on formulating holistic policies to accelerate the pace of development in the state, besides converting investments into capital. Enumerating the initiatives of the government, Khandu said that despite many challenges in the connectivity sector, the Government is taking up the construction of the TAH, rail connectivity to Guwahati and Delhi, making ALGs functional, besides working on bringing rail line in foothill areas of the state. Khandu also strongly advocated having a separate IAS cadre for Arunachal Pradesh for effective implementation of all central and state government programmes in the state.